You ever wonder where Calvin might end up in a few hundred years? HAHAHAHAHAhahaha-hak-hak-*coughcough* gag gasp! I died. Hahahaha, so fitting to Calvin's character! This is great, thanks for sharing. That is an awesome LotR reference! Perfectly done, thanks for sharing! you should make him holding the hobbes doll! you got his style down, only the font isn't recognizably "Watterson". really funny though. Gee I wonder if it was a quarter? heh heh heh ha ha ha HA HA AH AHHA AH AHA HA! that is friggin AWESOME! i laughed until tears formed!!!! Wow! Genius transition in the drawing!! thanks alot....i wouldn't say "Genius" but you did, so that's okay! Lol! I really did laugh out loud. 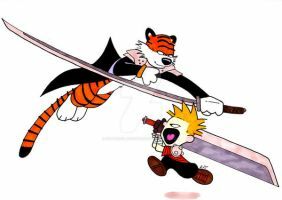 I'm a big fan of Calvin & hobbes. You did a great job in drawing him! That looks just like the original Calvin! How do you do it? lol your awesome! great job drawing calvin...oh watev IT WAS AWESOME!!!! Calvin and Hobbes was one of the best all time strips. Man I miss it. Yes, precious....the One quarter to rule them all. After graduation High School sweet hearts Susie and Calvin moved in together into a little apartment near the collage that both Susie and Calvin attended. Susie was studding to be a child psychologist and Calvin was taking writers classes and already had one sci-fi, action, thriller, comedy out and was working on the sequel. Then one day out of the blue Calvin got on one knee and proposed. Susie gasped as Calvin reached into his jacket and pulled out a small black velvet box. Susan Derkins, Calvin started as Susie covered her mouth. Will you marry me? he asked, and surprisingly Susie fainted.